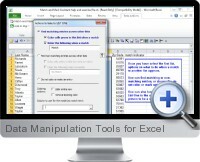 Excel Data Manipulation Tools is a collection of Excel add-ins added as a new menu tab which provide fast and productive tools for manipulating data in Excel. The data manipulation tools cover a wide range of commonly required tasks for importing, managing and outputting data in various formats. Stepwise wizards are provided to guide data manipulation tasks and allow specification of flexible options to meet data management requirements. Clean and fix postal address data with text splitting and zip code rationalization tools. Perform comparison analysis over multiple columns from multiple source lists with difference identification and reporting. Sort data based on background cell color and other styling criteria. Perform data consolidation from multiple files with options for final reporting. Copy and manage columns of data between multiple workbooks based on column titles. Create CSV files with advanced options quickly and efficiently. Convert and manipulate complex data structures in flat forma for pivot table reporting. Data cleaning options include text replacement and advanced pattern matching over multiple data sources. Data consolidation, splitting, extraction and loading can be defines based on row and column matching rules. Duplication identification is extended with options to remove, copy and move duplicated data. Advanced data searching includes options for filtering, search direction, pattern matching and list comparison with multiple words, numbers and or phrases. Perform data comparison with match highlighting over multiple ranges with one process. Manipulation tools for pivot table reporting and analysis. Data updating tools change data based on rules between two lists. Data conversion tools allow reports to be structured into clean tabular format for analysis. Hide, Unhide and extract rows and columns of data based on search criteria. Text file importing tools allow big data to be imported from multiple encoded formats.